This month I am simply spoilt for choice in terms of topics to write about, such is the fullness and speed at which the garden develops in April and May, and especially this year in the amazing weather we have been experiencing. Even as I type, the aroma of the first barbecues of the season is just reaching me and it is only April! Since last month, we have been really busy. The pergola is complete but I could move on to tell you about the new border which began to emerge during our week off work at the end of March, equally I could eulogise about the tulips that have been really spectacular this year, or I could tell you about the wonderful butterflies that have been entertaining us over the past sunny weeks. I have decided to plump for the butterflies. Last weekend, in less than an hour, we observed no less than seven different species fluttering around the garden. It began with a Comma, a r egular visitor that appears early each Spring and loves to sun itself on the pergola. The change in pergola has made no difference, the Comma butterflies (and there were at least two of them) still love the flat wood surface for taking a rest. Having said that, they seem to be the butterfly less intimidated by human beings as I have often been landed on! This end of the garden seems equally popular with Red Admirals and at one point last weekend we had two Commas and two Red Admirals performing an elaborate quadrille in the sky. The Red Admirals also seem particularly drawn to the pond and frequently rest on the marsh marigolds, I assume to sun themselves but may be to take nectar? Most of our butterflies arrive in pairs or more but the Speckled Wood seems to be rather a loner. Almost always to be found on the Choisya or occasionally on Lilac leaves, I have only ever seen one at a time and they also seem quite shy, never staying still long enough for a photograph. The Holly Blues are probably the most numerous but also the smallest of the butterflies we see each year. They have also got the year off to a prolific start as we saw at least four. As their name suggests, they are drawn to the holly bushes but they do seem to spread their territory right across the garden and are as likely to be seen up near the house as they are in the depths of the border. I will confess to finding white butterflies hard to identify. Unless they are side by side, how do you tell a small white apart from a large white? However, last weekend I definitely saw a Small White – it was really small and delicate! In fact, I’m not sure that we actually saw a Large White, the wonderfully named Pieris Brassicae – brassicas equal members of the cabbage family – yes, this is the Cabbage White! Another white butterfly that we saw and which is absolutely delightful is the Orange Tip. Easy to identify as its name suggests, a couple very obligingly stayed still on a leaf long enough for us to observe the dark spot within each orange patch on the wing tips. So that’s six species, or potentially seven, and that’s without mentioning the Brimstone that has been a regular visitor since the first sunny days of Spring. Rather confusingly, there is a Brimstone moth as well as a Brimstone butterfly and, according to my trusty butterfly book, they look awfully similar! However, I am pretty convinced we are seeing the butterfly as it has a fresher, pale yellowy green colour. All of this might sound like I know what I’m talking about when it comes to identifying butterflies but, to be honest, I don’t and I find it really difficult! 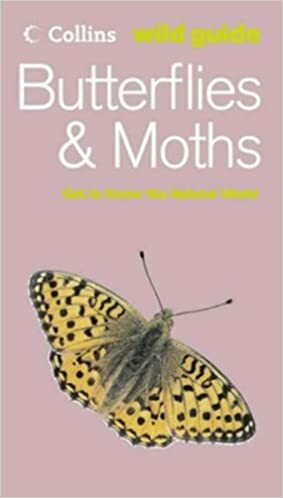 I signed up for a butterfly count a few years ago and spent a silly amount of time trying to navigate the Collins Wild Guide to Butterflies and Moths – it was incredibly difficult. I concluded that the bee count was much easier! Apart from the Peacock butterfly, I think it would be true to say that we have seen every butterfly that I am actually capable of recognising and naming over the past week! So if you see any more butterflies around the area, please don’t ask me any difficult questions about them. Seeing so many species of butterfly in the garden has been very rewarding. Apart from the occasional very careful limited sprinkling of so-called environmentally friendly slug pellets, we have not put any chemicals on our garden for at least fifteen years. I can’t help thinking that this may be one of the reasons we are now such a butterfly-friendly garden. We have also made a conscious effort to purchase plants that are either bee and/or butterfly friendly – the two often go together. However, I tend to assume this is more related to summer flowering plants than the Spring bulbs but clearly nature thinks differently. Either way, they are all a very welcome sight on a warm, sunny afternoon. Categories: Blog post | Tags: Butterflies, Spring, Wildlife garden | Permalink.